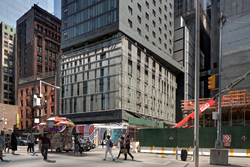 An attractive metal mesh screen-wall created by Cambridge Architectural for the Courtyard by Marriott in Lower Manhattan proved to be a creative solution for meeting New York City zoning and building codes while offering solar shading for hotel guestrooms on the lower floors. The 317-room, 30-story hotel -- just steps from the National September 11 Memorial and Museum and One World Trade Center and Observatory -- was completed earlier this year. Located at 133 Greenwich St., it sits on the perimeter of the original World Trade Center site. Danny Forster, principal of Danny Forster Design Studio, chose more than 4,100 square feet of Cambridge Mid-Balance mesh to clad the Courtyard’s podium. The mesh provides protection from the sun as well as passive cooling for the guest rooms on the bottom five floors of the hotel tower. In addition to being a world-class designer, Forster is the executive producer of the Discovery Channel’s “Rising: Re-building Ground Zero” and co-host of the network’s new documentary on China’s growth that premiered in October. During the hotel’s design process, a problem developed that was ultimately solved by Forster’s use of the screen-wall. Zoning laws in Lower Manhattan require street walls to be held to a height of 85 feet, meaning buildings cannot be set back until they rise above that height. This requirement would have created a podium with inefficient-sized guest rooms that were too long and deep. Selecting a Cambridge Architectural metal mesh screen with 50 percent opacity, Forster struck the right balance to convince city officials that it was both a wall (meeting zoning law) and a window (meeting building codes). In place, the mesh still provides guest room views of the September 11 Memorial. By creating the mesh screen-wall and puling back the actual interior walls by seven feet, Forster achieved right-sized guest rooms. It also provided 3,600 square feet of usable floor-area-ratio (FAR) that could be redistributed to the top of the building to create a roof top bar. “Our metal mesh looks great and frequently provides aesthetic, environmental and security design solutions,” said Cambridge Architectural Sales Director David Zeitlin. “But this was a rare instance when it helped designers meet code and move forward with a concept that otherwise would be rejected. Project: Courtyard by Marriott New York Lower Manhattan/ World Trade Center Area, 133 Greenwich St.
Cambridge Architectural is the most experienced full-service provider of sustainable architectural mesh systems for both interior and exterior building applications. As the world leader in tensioned mesh systems, Cambridge Architectural metal fabric solutions lend unique aesthetic appeal, functionality, affordability and sustainable benefits to a variety of structures interior and exterior. Cambridge Architectural offers full system design, engineering and collaboration from concept through installation – in the most challenging building environments and under the strictest budgets. Cambridge Architectural metal fabric systems are categorized by the primary applications they serve, including parking structures, exterior shades, facades, canopies, curtains and others. As a member of the United States Green Building Council, Cambridge Architectural is committed to promoting methods, technology and products resulting in environmentally responsible and healthy buildings. The Cambridge Architectural team develops systems that meet or exceed LEED requirements and provides consultation and direction on a project-by-project basis. Visit http://www.CambridgeArchitectural.com for more information.